The Referee's Closet is now offering the service to have your numberplate attached to a new jersey. Please note, having The Referee's Closet attach a plate to a new jersey renders that jersey unreturnable except for manufacturer's defect. There are no exchanges or refunds of a jersey for size/fit issues once a plate has been sewn on. 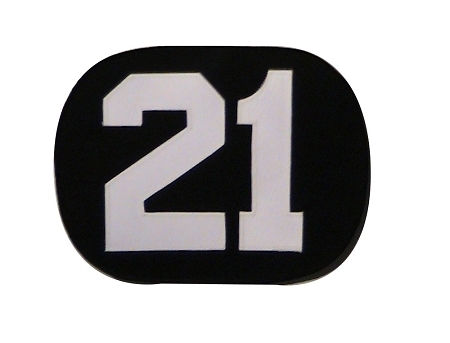 Our numberplates feature 6" white tackle twill numbers sewn onto an oval (roughly 10" x 8") black tackle twill backing. (3-digit numbers will be assembled using 4" numbers.) Black backing has a stitched edge to prevent fraying. Enter the information EXACTLY as you would like it to appear on your Number plate below. Please double check your entry as there are ABSOLUTELY NO refunds or cancelations for plates once we order them.